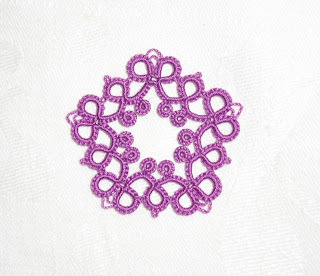 Two more motifs from the Cariad Tatting website. 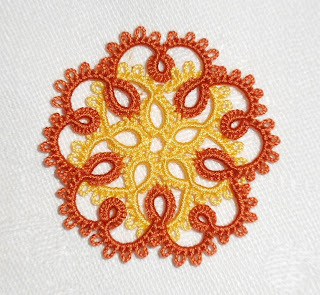 Jennifer Williams' patterns are very well written with precise instructions and even the length of thread needed to be wound on each shuttle! What a luxury. This first one didn't work out completely right. Although it calls for a 1cm gauge for the long picots, I found them too short to be able to get the pointy shape as per the photo on the pattern. It meant I had to pull on them a bit too much thereby distorting the shape of the rings slightly. 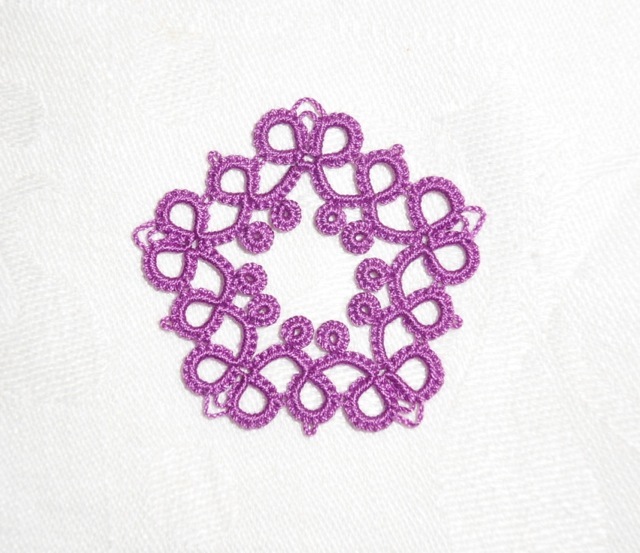 I may re-do this one with a longer picot gauge. This second one I really like though I'm not happy with the colours I chose. I think it definitely calls for being re-done in different colours as it's very pretty and I like how the second round overlaps the first. Also, though not a regular FSBS tatter, in this case, I think it is well worth it but I only decided to do so on the second round. So there, two reasons why I will need to re-tat this motif as well. both patterns are pretty. Your renditions look good, but I can see how you might want to re-tat with the changes you suggest. Are her thread length suggestions pretty close? I think they're both very pretty, and I really like the color combo of the second one. It reminds me of Bit O' Honey candy! lovely motifs. i think the first is very crisp and dainty. I like the colours of your second motif. Both nice motifs. I'm glad you're using Jennifer Williams's patterns, I think they're great. I discovered them a few months ago and put a link to her blog on mine, but I don't have the impact that you do. I love both patterns and the second one the colours are bright and cheerful which what we need on a dull rainy day like today. Yes, you're right Margaret! Pretty miserable today here too! I think they're both beautiful! You do such lovely work. It's always a pleasure to look at. I don't think the orange and yellow one is that bad, it reminds me of a color scheme out of the 60's or 70's, those were my grandmother's favorite colors. I'm going to have to run over and look at those patterns.